Beauty UK is a really interesting brand that has caught my attention when browsing the aisles of Superdrug. I first spotted them when I picked up a palette of eye shadows for a US-UK swap, then I noticed they have a great range of nail colours and most recently the new mineral products that looked very ‘MAC’-like. I was sent of the the mineral blushers and a ‘lip lust’ gloss to try out. To be honest, the lip gloss isn’t really my sort of thing – the colour is too brown toned for my skin (but think it would look lovely on someone more tanned than me) and it has too much glitter for my tastes, but the blush is absolutely lovely. 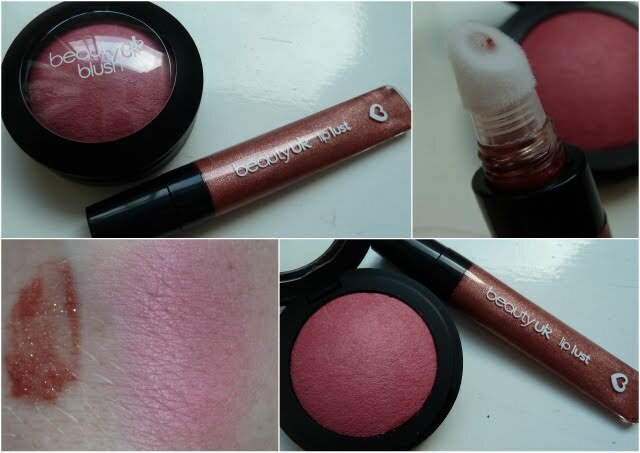 On first look the blush looks like more of a ‘winter’ shade, but when swatched it looks a lot brighter with a hint of a sheen that makes the cheeks look glowy without looking shimmery or like little disco balls on the cheeks. I really like this pink shade and think it would suit the majority of skin tones. It can be applied lightly or built up if you want more colour. I’m now really keen to check out the other blusher shades and the eyeshadow trios, the trios look gorgeous with a really interesting range of colours. The mineral blushers (and eye trios FYI) cost just £3.99. The lip lust is £2.99.